Moonwalk Rentals, Disco domes, Dance domes, inflatable rentals in the Atlanta Georgia area. Great for cold weather! Enclosed Dome will block out cold and wind. We love our new product line -- "THE Dance DOME". Make sure you play the video. There are disco lights and a great sound system. You have the added bonus of being able to bounce around the "THE Dance DOME" just like a regular inflatable. This is not just for kids... A lot of adults are using too! The exterior is is printed in a disco theme with a high multi-colored roof which produces an incredible visual impact. The dome interior is fitted with a flashing lighting system which light bounces off the glossy black interior. The Dance Dome can hold up to 12 younger kids at a time. Half of rentals are for adults! The Dome is large, 20'L x 24'W x 18' HIGH! You can play any music that you have saved and can send through the blue tooth system. We arrive before your party and setup the Dance Dome for you. We will go over the instructions also. Delivery only, no customer pickups on this item. The sound is installed with a bluetooth music system which allows you to connect their phones to send music to "The Dance Dome"! How cool is that! Star Wars moonwalks are in!! 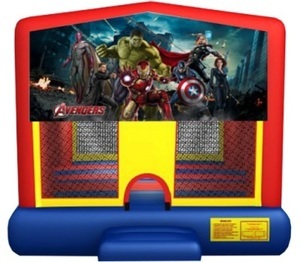 We have a wide variety of moonwalks andbouncers to make every child and parent happy. Moonwalks make any event more fun! Remember to ask your vendor for proof of insurance. We have a $1,000,000 policy. Be safe, be sure. For customer pickups, you should have a pickup truck, van (with no back seats), or large trailer. SUV's must have the back seat(s) down or removed. You cannot fit a combo in a SUV. Please, do not show up in a car. We will not load the units on the roofs or trunks! Moonwalks go by many different names. 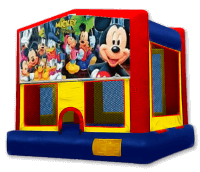 They include bounce houses, bounce castles, jumpys, inflatables, spacewalk, jump jump, bouncies, astrojump, moon bounce and more. They result is the same--FUN FOR ALL! We are very excited to announce our new line of religious themed moonwalks. We have a Noah's Ark moonwalk, a Jonah and the whale moonwalk, and a David and Goliath Moonwalk. Please reserve early. 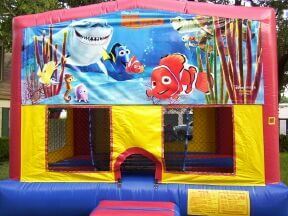 They are already in high demand and churches love them for their events!